Aslan is the only character to appear in all seven of The Chronicles of Narnia by C. S. Lewis. Several actors, including David Suchet and Liam Neeson, have taken on the role. What makes the character so tricky to get right? Which portrayal of Aslan is the best? Listen below and post a comment! This episode concludes Season 3. Thanks for listening, everyone! We will be back next year. Visit the Facebook group for more discussion. And, check out these other C.S. Lewis podcasts: All About Jack, The Lamp-post Listener, The Eagle and Child, and Wade Center Podcast. Order your Talking Beasts mug before Dec. 31! David Suchet = the best/worst Aslan? That’s probably a fair assessment. At times he sounds like a hammy television announcer. But the moments when he deepens his voice and speaks more naturally, he shines. For me personally, he does such a great job sounding "otherworldly" as Rilian put it, that it outweighs the more laughable line deliveries. I especially love him in THahB when he’s speaking with Shasta, "I was the Lion…"
I’ll be honest, Liam Neeson is not a great Aslan. I think he *could* have been, but his performance doesn’t have a lot going on in it. He sounds like Liam Neeson reading lines from a script. Don’t get me wrong, Neeson is a wonderful actor and his voice seems right on paper. I don’t know what directions he got, but there’s not a lot of resonance or personality in his Aslan, beyond Neeson’s normal voice. Meaning, he could’ve been reading for any character. He could have been reading the phone book. And of course, lines like, "Beaver also mentioned that you planned on turning him into a hat" don’t help. I really hope we get something special with the Netflix adaptation. There are surely actors out there that could capture the ineffable, mysterious, wild qualities of the Lion. Thanks for including those audio clips of the different Aslans. It’s been a while since I’ve re-experienced a Narnia adaptation so it was nice to be reminded what they sound like. Here are my thoughts on the voices, putting aside all questions of visuals and writing. 1967. I felt he was too mechanical in the scene with the Witch but really good in the scene with Lucy and Susan. I have mixed feelings about his roar. It has great energy but after a while it sounds like gargling. Still way better than I could do. 1979. I feel like I should like this one but I don’t. He definitely sounds commanding and intimidating but lacks something, warmth maybe? 1988.Meh. Too soft and unemotional for my taste. It might work for some people though. Maybe they were going for an Aslan that speaks softly and carries a big stick. 1999. This is probably my favorite. He’s super hammy but you have to remember this is for radio. The only way they can show that Aslan is a powerful lion is through his voice. Using a nonvisual medium actually was an asset for this adaptation in a way. It’s easier to be scared of something you can see than something you can. So this Aslan actually felt the scariest without sounding evil. 2005. If this were the only adaptation of Aslan, I’d probably find it pretty meh. But after all the hammy Aslans I’d heard, (I know I said the BBC Aslan was too quiet and calm but he’s quiet and calm in a hammy way), it actually made a nice change. His voice isn’t particularly awe-inspiring or otherworldly, to use Rilian’s word, but it gave Aslan a certain humanity that hadn’t been seen before. I think I’ll comment more later on how Aslan should be portrayed. Until then, it was great having you on the podcast, Gymfan! You’re so much fun. Hope you enjoy your trip. Got to admit, the sight of a Lion moving his lips to speak human words is inherently comical. Aslan should just look like a Great mute Lion! And his "voice" should be a voiceover: an intimate, infinite whisper. I have always liked the BBC’s Aslan the best with the lion’s gentle side. It worked well for this part of his character. The 1979 cartoon Aslan was okay but there wasn’t much tone in his voice. I had liked the sound of the Disney’s Aslan (Liam Nielsen’s voice), but I wish they had given him a stronger role. By now I have become used to David Suchet’s version, but it is a bit exaggerated and overacted. The 1967 Aslan might have worked better in an audio version, but of course they were making a simple TV drama at that time. Too bad not much of the old drama survives. Hated David Suchet. At his best, he was bearable, at his worst he ruined the adaptation. He was even worse than Ron Pickup in that ghastly tv adaptation of Narnia. That’s not to say Suchet didn’t have his moments, but if we have to take the whole of him, he ranks at the bottom for me, and I don’t have to think twice about it. Liam Neeson was solid enough. Not spectacular, but did what he needed to. My favorite overall is probably Steve Thorne. Not in the cartoon – he was apparently told to play it over the top and it sounds awful. He reprised his role as Asian in Tales of Narnia for BBC Radio and gave a bit subtler performance. On the whole, I think he is probably my pick. There’s unquestionably room for a definitive Asian since I’m not sure any of them has staked out that ground yet. IMO. The animated version was so thrilling to my brother and I as kids that we promptly started constructing armor out of cardboard. Perhaps if I had seen the BBC version first I might have liked it more? I don’t know about that, but we do have a family friend our age who favors them. Go figure. Incidentally, there is a "Narnia: The Musical," believe it or not — it’s pretty good! — and I had the fun of playing Mrs. Beaver in a local community theatre production more than ten years ago. So, I’ll echo the shout-out to the theatrical versions! On another note, I have been a mostly quiet, casual and sporadic observer of Narniaweb since its beginnings; I just wanted to pipe up and give my two cents. I’m here! (though I’m not on Facebook.) I also care very much about how the next round of Narnia adaptations will turn out. As was mentioned, Aslan’s portrayal is a crucial element. Thank you for your hard work running the site. I hope to get a mug for Christmas or order one shortly thereafter. Why is Aslan so hard to get right? Say whaaaaaaat? I mean since the BBC’S attempt of Aslan whereby the animatronics had a habit of getting stuck mid sentence the big screen Aslan came to the rescue and put the BBC to shame. The only thing the movie version of Narnia got right is Aslan. The big screen really did Aslan justice. A real shame about the poetic licence and completely changing the story of The Voyage of the Dawn Treader. You know, I think I can find some version of my opinions on this topic right here on this page. I have a mingled disgust and respect for David Suchet; I think he got the basic sound of the voice right, he just overreacted. I’ve seen Ronald Pickup in at least one other movie, and it sounds like he was totally faking his voice for Aslan, and in some cases, overreacted like Suchet did.Liam Neeson was good. Just good. Nothing else. He had an okay voice, but it was just kinda boring. So here’s a weird suggestion (to go with Glumpuddle’s Clint Eastwood idea): If Netflix really can’t do too much with CGI, why not use… a REAL lion?? (A tame one, though). The mouth could be animated for his speaking parts, and all the rest could be real. Imagine the way the actors would he able to react to that… it might better reflect the fact that Aslan is not safe. And there’s nothing that better portrays the power of a lion than… a real lion. That’s a pretty cool idea. However, I think some animal rights people would destroy the (movie? tv show?) if that happened. But it definitely would portray the "not safe" factor. WAIT WAIT WAIT not to be a nerd (actually absolutely to be a nerd) isn’t the Spearhead a Narnian star? In the Last Battle, doesn’t Lewis write about their polestar, which is brighter than ours? As for which Aslan version I prefer, I only really have listened to the radio dramas/audiobooks and Walden versions. That said, I prefer Liam Neesons because even though he didn’t put too much majesty or fierceness in Aslan’s voice, I think the he ended up sounding, if not "unsafe" at least "good." I also really liked the unabridged Last Battle audiobook narrated by Patrick Stewart. It’s been a while since I listened to it, so I can’t totally remember how he voiced Aslan’s lines, but it was my favorite audiobook version out of all the ones I’ve listened to (unabridged or otherwise). Totally recommend it if you haven’t listened to that version. Incidentally, I would love a podcast on Narnia’s end credit music. Just in case you need ideas for next season. Yep, Spearhead is Narnia’s polestar. He also mentions a few other stars throughout the books (along with a few constellations such as Leopard, Hammer, and the Ship). The animated version was much more magical for me as a child than the BBC. Then I was given I was given the Focus on the Family Radio which I’ve listened through my young teens and young adult years. I think now my favorite has come to be the Liam Neeson version, but it’s very close between that and David Suchett version. All three hold a very special place in my heart. For the voice/motion-capture of Aslan in the new Narnia Netflix series, I wish that Netflix would look outside the box and find a voice actor (or voice actress; E.T. was voiced by an old lady!) that was not a Liam Neeson type: Older, Irish-Born like C.S. Lewis with a luke-warm-Christian background. No thanks. Aslan is not a man. And he’s not a real Lion, but an idea of a Lion: Strong, intimidating and untamable. And unpredictably joyful. He has the qualities of both an enigmatic & merciful human king, and of Christ himself. If Netflix found a wild, warm, deep-voiced man who was also in his early thirties and had an ethnic background in Middle Eastean Judaism, Christianity or Islam,, that would be almost unbelieveable, but in my mind, that’s the only actor I can imagine doing Aslan justice. Aslan is not James Earl Jones, not Idris Elba and not Liam Neeson. A young, deeper voiced Omar Sheriff type would be a facinating pick (though Now that I think about it, Omar Sherrif’s voice is more of a Tiger than a Lion). Netflix: PLEASE DON’T MESS UP ASLAN! A bit off topic, but may I ask what you mean when you say Aslan isn’t a real lion? Like obviously Aslan isn’t some random talking lion, after all he created the Talking Beasts of Narnia. But in HHB he tells Bree (who thinks Aslan being called The Great Lion is a metaphor not literal) "I am a true beast"
What I was meant was ‘Aslan is more than a Real Life Lion in the Narnia books and Lewis wrote him as such’, because a Lion was considered the King of Beasts in classic literature, not because a real lion is an especially special creature (Real life male Lions sleep about 15-20 hours a day…the slackers…). If you look at other Lion characters in the Narnia, they are more like Real Life Lions, and are just fellow talking beasts or dumb wild ones (though both are revered in Narnia nonetheless). That’s what I meant. Also, Aslan was portrayed in the first Narnia movie as a Actual looking Lion, which took away from his majesty in the book (Who imagined Aslan’s head is at Peter’s chest-level instead of towering above him?). 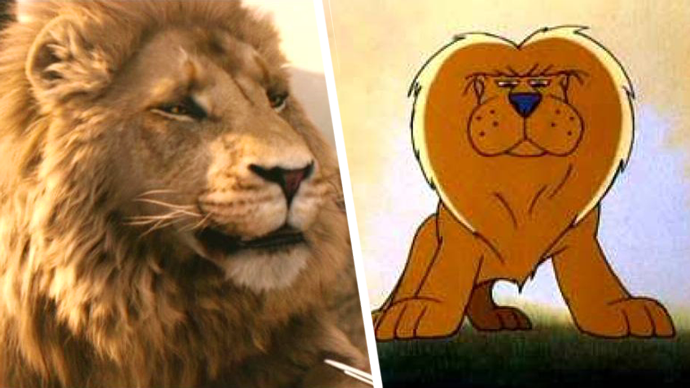 Surpassingly, the animated version did a better job at conveying the fantastic nature of Aslan, by making him more stylized and enormous, i think. I’ve been thinking of cinematic characters who are scary but you still get the impression that they’re good guys. The one I keep coming back to in my mind is Nanny McPhee. That may not be a movie that people here would be interested in but if we only referenced books or movies that we could sure people were familiar with, we’d never do it at all. And Nanny McPhee stood out to me because, in interviews, actress/screenwriter Emma Thompson described her as similar to the Western hero archetype touched on in this podcast. Since this was the season finale, I wanted to say that I really liked how this season had an average of one book related episode and one adaptation related episode a month. What I like about this podcast is that the main podcasters aren’t snobs about the very idea of Narnia adaptations (well,…OK, Glumpuddle is an aesthetic snob but that’s not what I’m talking about), but they don’t mindlessly embrace an adaptation regardless of specifics. Of course, there’s nothing wrong with either of those mindsets. If you think people should never adapt the Narnia books or that any adaptation is fun, that’s OK. But the position this podcast takes is (a) closer to my own and (b) makes for more interesting discussions. Really looking forward to the return of the Horse and his Boy analyses. It’s been interesting hearing the podcasters’ "pure" thoughts on a book that hasn’t been adapted yet. I’d love it if they could do The Magician’s Nephew and The Last Battle before those books are adapted though that’s probably impractical. I’m really a sucker for Liam Neeson’s portrayal, I can see why some don’t, but still. I hate the audio book version, absolutely cringey. Anyways, this has been fun! I look forward to more!